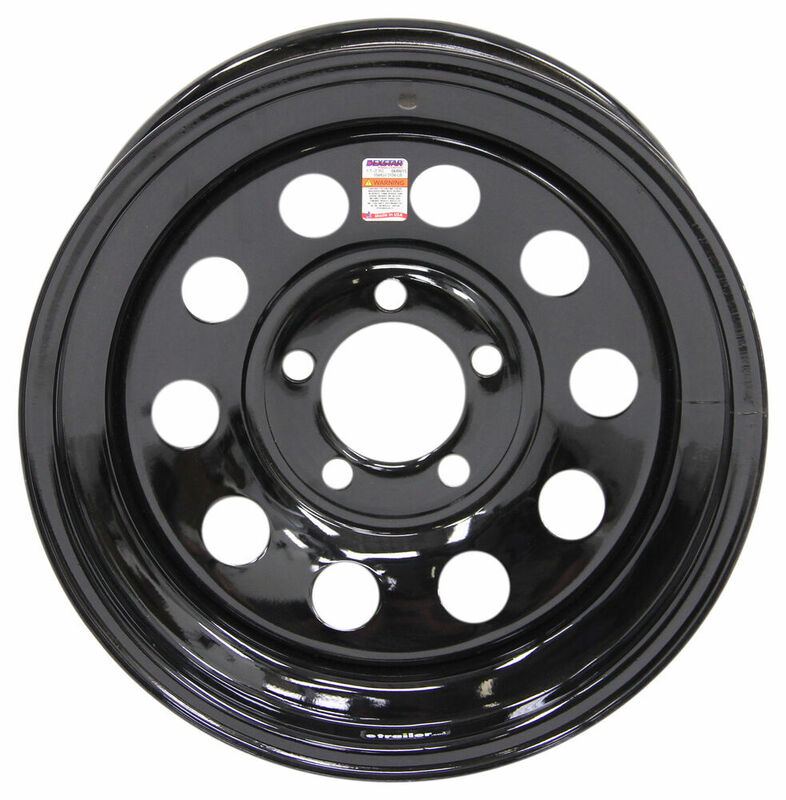 This 15" x 6" steel trailer wheel has a 5 on 4-1/2 bolt pattern and a 3.19" pilot diameter. Rust resistant black powder coat finish. Lowest Prices for the best tires and wheels from Dexstar. 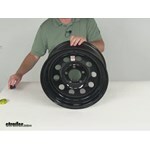 Dexstar Steel Mini Mod Trailer Wheel - 15" x 6" Rim - 5 on 4-1/2 - Black part number AM20545 can be ordered online at etrailer.com or call 800-298-8924 for expert service. 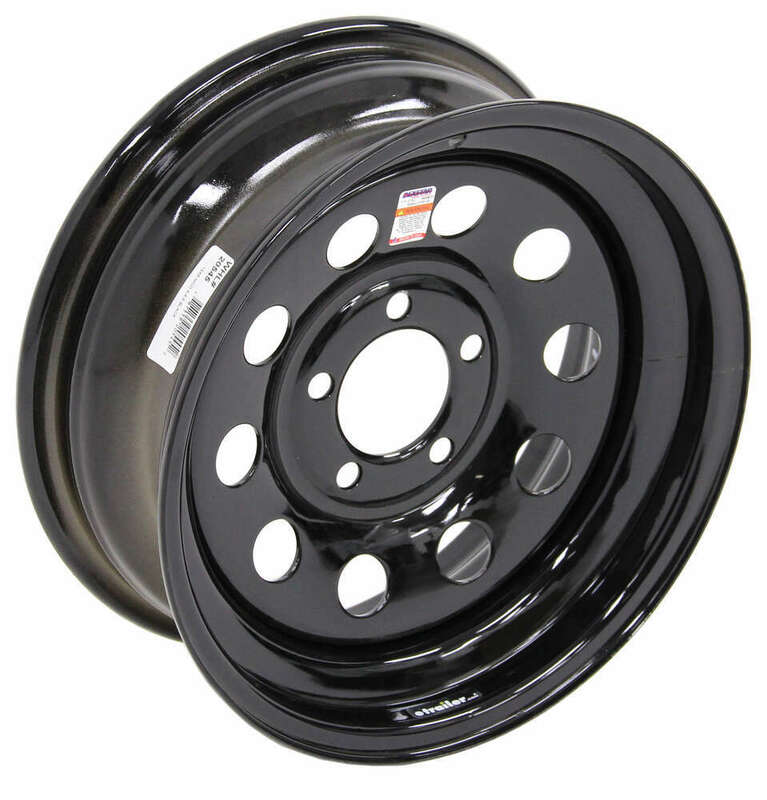 Black power coated, 15" steel wheel features a 5 on 4-1/2 bolt pattern and meets Department of Transportation standards. 15" x 5" Trailer wheel has 5 on 4-1/2 bolt pattern and 3.19" pilot diameter. Rustproof aluminum wheel has split-spoke design in black. Steel inserts in lug nut wells secure wheel. Complimentary roadside assistance included. Radial tire has a ply rating of 8 and a 2,150-lb maximum load at 65 psi. 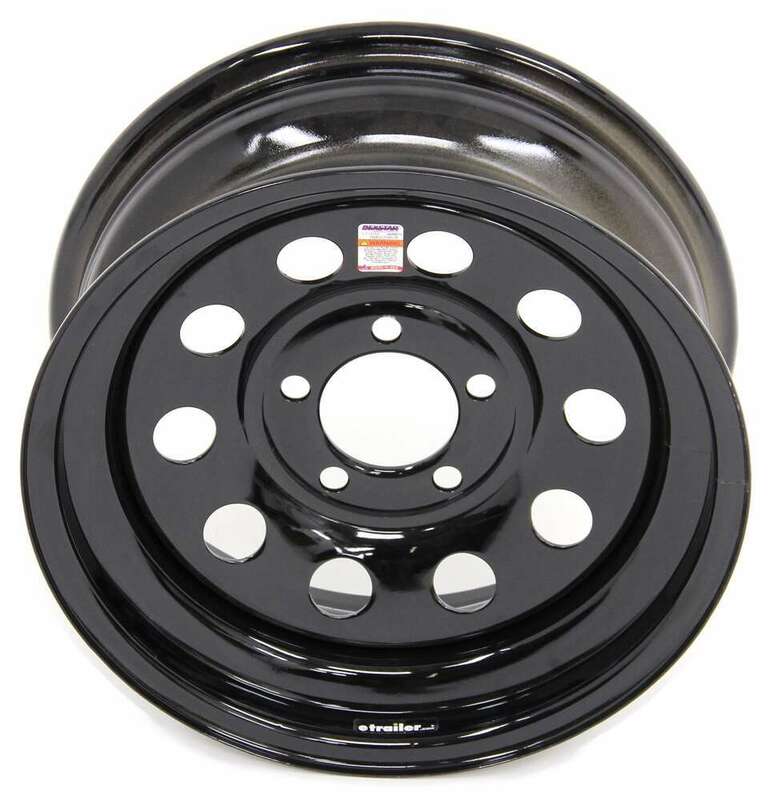 The 15" diameter x 5" wide steel trailer wheel has a 5 on 4-1/2 bolt pattern and a corrosion resistant, black powder coat finish. 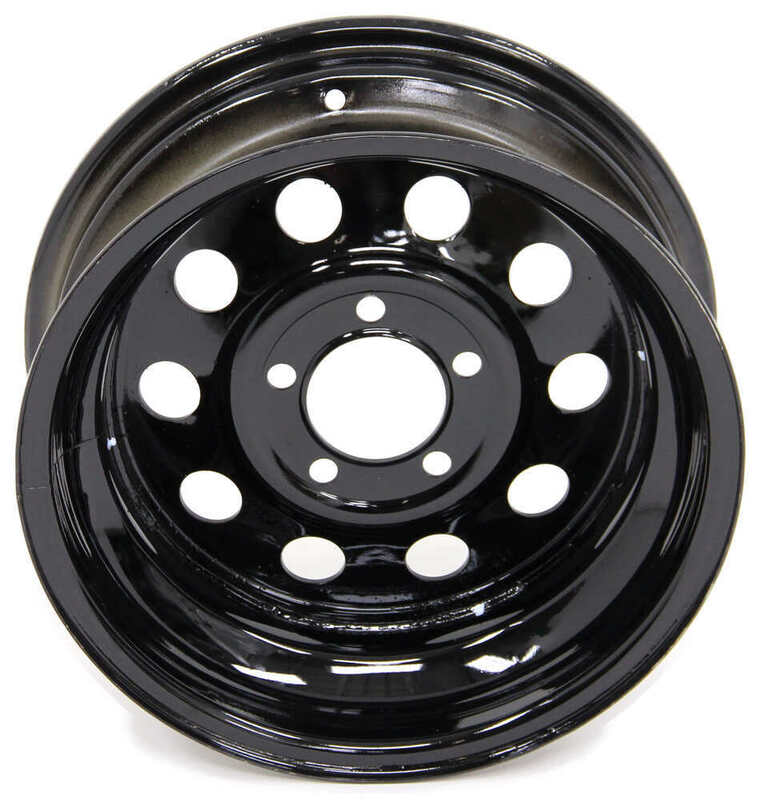 Today we're going to review part number AM20545, this is the Dexstar 15" by 6" Black Steel Mini Mod Trailer Wheel with the 5 on 4 1/2" bolt pattern. This steel wheel has the modular design, or the mini mod design, and by that they mean it has the round holes all the way around. It's very sturdy, very corrosion resistant. 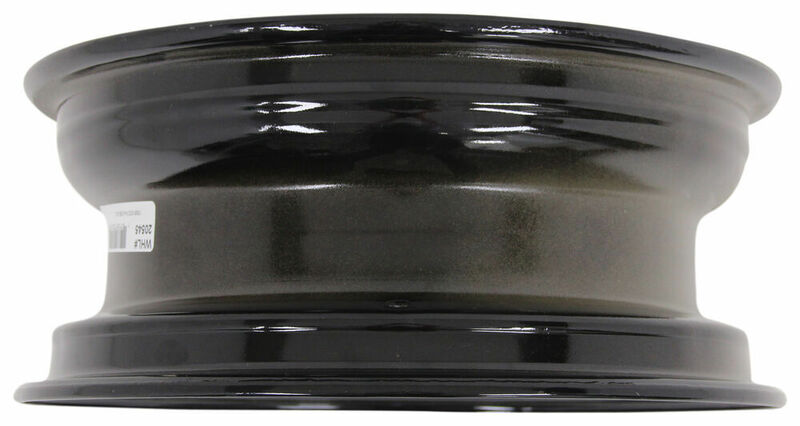 Does use a two step finishing process on the wheel, what they basically do is first put an eco-primer down and then a black powder coat finish over the front and even the back of the wheel. This wheel does meet the Department of Transportation standards, it is made in the USA. On the specs on this wheel, the rim dimensions, the diameter is 15" and it's measured inside the inside and the width is also 6" wide, inside to inside. When you go to measure this, you're going to be measuring when a tire is seated on here, the beads of the tire seat right in here, so that's what you'll be measuring. When we do the diameter it's going to be inside to inside, so if I take a tape measure here and if we put it on that diameter, you'll be able to see it's right at 15" diameter, the width again, is going to be inside to inside, so if we put a tape measure on that, right at 6", so 15" by 6". The bolt pattern on this wheel, it's a 5 lug 4 1/2" bolt pattern and on a wheel that uses an odd number of lugs, in this case five, the way to measure the bolt pattern is you just pick one of the holes, and then measure directly across to either hole right across from it. You can measure from this hole to this one, or this to this. The trick is to get the correct measurement, you need to measure from the starting hole center, to the outer edge of the hole that you got to. If we go from this hole to this hole, try to show you, we'll go center to outer edge, and see it's right at 4 1/2", so 5 on 4 1/2" bolt pattern. It does use a wheel lug size of 1/2" by 20. This does have a weight capacity of 2,150 pounds and the pilot hole diameter, which is the large hole here in the center of the wheel, this goes over the hub on your trailer, diameter of that opening is going to be right at 3.19". That should do it for the review on part number AM20545, this is the Dexstar 15" by 6" Black Steel Mini Mod Trailer Wheel with the 5 on 4 1/2" bolt pattern. Order: RelevanceNewestRating - High to LowRating - Low to High This 15" x 6" steel trailer wheel has a 5 on 4-1/2 bolt pattern and a 3.19" pilot diameter. Rust resistant black powder coat finish. 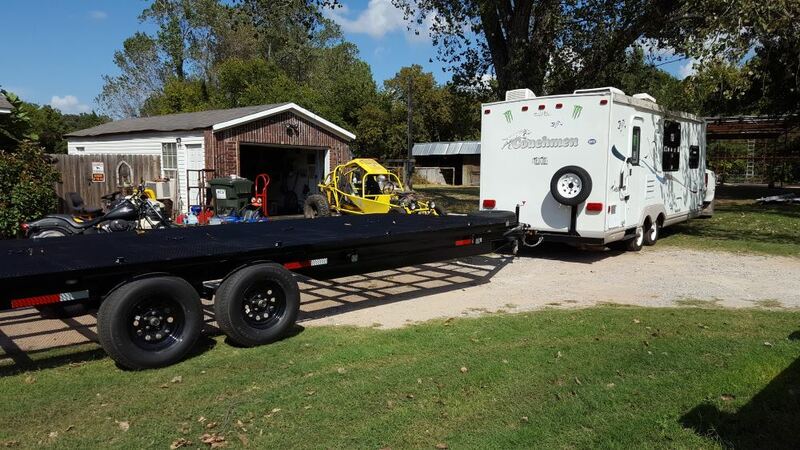 So glad I ordered from etrailer. Great value and still happy with the product! Rims are perfect. Use these to replace 14 rims on your 3500 axles so you can upgrade to better tires.. it is worth it. Very few good tires with enough load capacity for the 14 rims. Ive been very pleased with the purchase. While these were the basic black rim that went on a flatbed utility trailer, the ability to move from a 13 tire to 15 tire was why I needed. No more undependable small tires! Thank you! After a year the wheels are still looking and performing great. They clean up easily and as for service has been superb. I went and pulled a Dexstar Wheel part # AM20545 from our warehouse to measure the diameter of the valve stem hole and found it to be .453 of an inch in diameter. For an 80 psi valve stem to fit this you would want part # AM20904. The psi limiting factor of a wheel setup is almost always going to be the valve stem. Dexstar Steel Mini Mod Trailer Wheel # AM20545 does not have any offset. I confirmed this with Dextsar. Also if a wheel does have offset we will indicate this in the item's specs. This Dexstar wheel is a 15 x 6-inch size with a 5-on-4-1/2-inch bolt pattern. It features a 2150-lb capacity, fits 1/2-inch diameter wheel bolts and can accept tire sizes 205/75-15 and 225/75-15. This wheel is USA-made and meets all DOT standards. A tire with the size 215/75/15 would fit on the Dexstar Rim part # AM20545 that you referenced. These rims can also handle 65 psi as well. 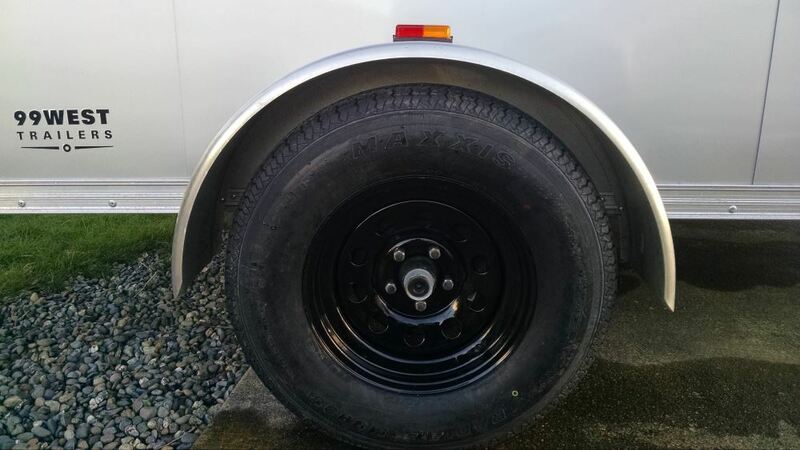 You should note that this rim should only be used on trailers and not trucks. The max tire pressure the valve stem # AM20904 can handle is 80. 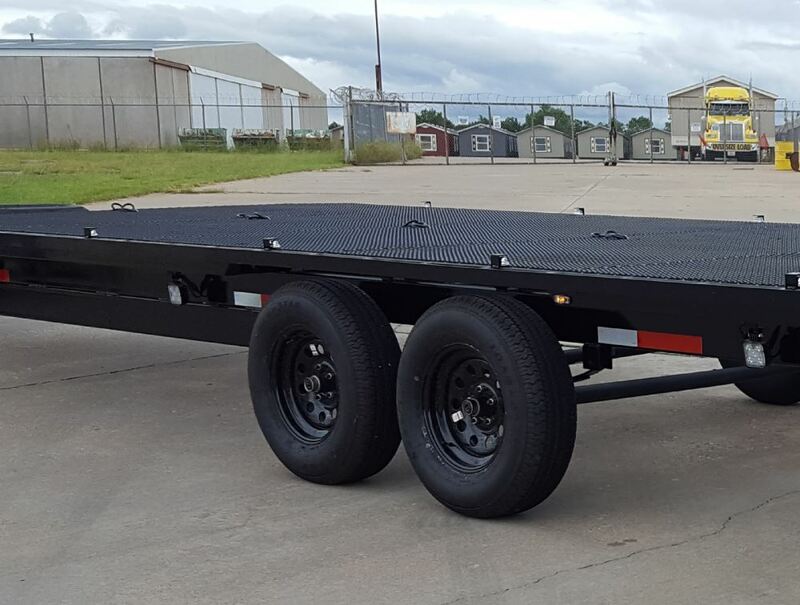 The tire size you listed isn't a standard trailer tire size, but the Dexstar Steel Mini Mod Trailer Wheel # AM20545 that you referenced could have a 235/75R15 mounted to it pretty easily. You should note that this wheel is designed and rated for use on a trailer. It has a zero offset and has a wheel bolt pattern of 5 on 4-1/2 inches. I went and pulled a Dexstar Wheel part # AM20545 from our warehouse to measure the diameter of the valve stem hole and found it to be .453 of an inch in diameter. For an 80 psi valve stem to fit this you would want part # AM20904. The psi limiting factor of a wheel setup is almost always going to be the valve stem. Check your tires for their maximum PSI rating because you always want to run trailer tires at their max PSI. Dexstar Steel Mini Mod Trailer Wheel # AM20545 does not have any offset. I confirmed this with Dextsar. It sounds like you are asking about the backspacing which is the distance from the mounting flange to the outside of the rim. Since this is a 6 inch wide rim the back spacing is 3-1/2 inches. To determine this you take the overall width of the rim and add an additional inch for the lip on the wheel and then divide by 2. The Dexstar Steel Mini Mod Trailer Wheel # AM20545 has a max capacity of 2,150 pounds. Load Range E tires are rated up to 2,830 pounds so you'll be limited by the wheel's capacity. The psi rating of a wheel is determined by the valve stems. They aren't included with the Dexstar rim so use # AM20904 that are rated up to 80 psi. I've linked our selection of Load Range E tires that will fit the Dexstar Rim. I'd be happy to let you know the weights of all of the parts you asked about, and I'll even do it in descending order. - Timbren Axle-Less Trailer Suspension System w Electric Brake Hubs # A35RS545E: 134 lbs - Dexstar Steel Mini Mod Trailer Wheel # AM20545: 25 lbs - Pro Series Round, Snap-Ring Swivel Jack # PS1400300303: 13 lbs - Channel Tongue Trailer Coupler # CT-3002-Z: 4 lbs I have also attached links to video reviews of these parts for you to take a look at. We have center caps that would fit the Dexstar Steel Mini Mod Trailer Wheel part # AM20545 but none of them are painted black. They are all chrome but could easily be painted black. For the cap you would want the part # 319EZ.